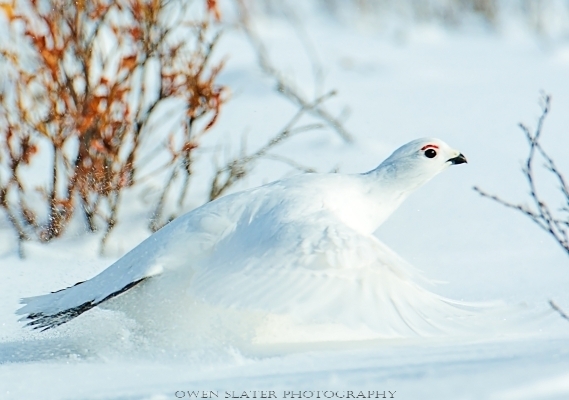 A willow ptarmigan kicks up snow as it bursts into flight to rejoin the rest of the nearby flock. 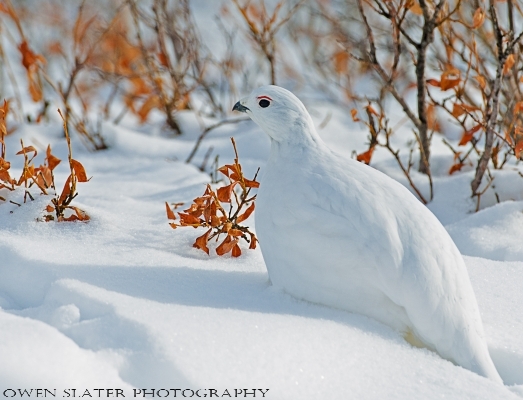 One of the other hardy species I came across on a daily basis in Denali where the willow ptarmigan. With their almost all white feathers apart from the red upper eyelashes and their black tails, they are sometimes hard to find. Fittingly, this one made its way through some willow bushes to browse on the freeze-dried leaves. These birds are quiet adaptable. When storms blow in or when predators are around they will fly into the snow and bury themselves beneath it to either wait out the storm or avoid being seen.